Research and development of hybrid wheat has a long history. Pickett (1993) has thoroughly summarized the principal events in this history through 1990. He begins the chronology with the proposal for hybrid maize by G.H. Shull in 1909 and ends in 1990 with Cargill ceasing development of hybrid wheat in the United States, yet continuing with commercialization in Australia and Argentina. The 259-page work by Pickett (1993) is the most extensive publication on hybrid wheat known to the authors, and they refer the reader to it for further information. A number of significant events have transpired since the Pickett (1993) review. Notable events include the 1997 registration in the United States of GENESIS. as a chemical hybridizing agent for wheat by Monsanto Company. In addition, France has granted a provisional registration for the use of GENESIS. Other hybridizing agents, such as the Sogital compound SC2053, continue to be widely utilized in the development of hybrid wheat. With the development of chemical hybridizing agent technology, there has been a substantial decline in research activity on cytoplasmic male sterility (CMS) as a hybrid production system. A number of hybrids have been submitted for commercial registration in several European countries and have entered the marketplace in both Europe and the United States. All of these hybrids, to the authors knowledge, have been produced with chemical hybridizing agent technology. The last CMS hybrid to be submitted for testing in uniform trials coordinated by the United States Department of Agriculture was in 1995. All of the hybrids entered into those trials since then have been produced with GENESIS. It is worth noting, however, that a CMS hybrid released by HybriTech in 1993 has continued to gain popularity and market share in the northern plains of Montana in the United States. Additional developments in the chronology of hybrid wheat would have to include advances in the development of the science of genomics, which could lead to an improved understanding and ability to exploit the phenomenon of heterosis in this complex allohexaploid. Transformation of wheat, now possible with particle gun and Agrobacterium ssp. technologies, also may lead to further investment in hybrid wheat due to genetic dominance of transformed genes and an ability to capture the value in a hybrid crop. This chapter provides a brief overview of the significant aspects of hybrid wheat development, including hybridizing systems, heterosis, economic advantage, breeding and seed production issues. Wilson and Ross (1962) were the first to describe a workable cytoplasmic male sterile, nuclear-restoration system when they reported that Triticum timopheevii cytoplasm induces male sterility with largely neutral effects on agronomic and quality characteristics. This discovery led to the establishment of a number of research programmes to evaluate alternate cytoplasmic sources of male sterility with common wheat and the nuclear genes necessary to restore fertility to the F1 hybrid. Virmani and Edwards (1983), in a comprehensive review of cytoplasmic male sterility, reported that 15 different cytoplasms of the genera Triticum and Aegilops have been recognized and that several of these could form the basis of a CMS system. However, they also stated the T. timopheevii system has gained widespread use due to deleterious effects of the other cytoplasms on various traits and/or because no advantage existed over the T. timopheevii system. Panayotov (1983) reviewed 129 cytoplasms of species and subspecies in five different genera and reported that 37 cause male sterility. He also reported that several of the cytoplasms depress growth and development of the wheat plant and that cytoplasmic heterosis was found among some of the fertile alloplasmic lines. He et al. (1998) reported that the Chinese national hybrid wheat network first emphasized the use of T. timopheevii CMS, but that Ae. kotschyi and Ae. ventricosa were also being utilized. They report that three hybrids based on T. timopheevii and six hybrids based on Ae. kotschyi had a 15 percent advantage over commercial pure line cultivars. Pickett (1993) briefly reviewed the effects of 20 different cytoplasms from Aegilops, one each from Haynaldia and Secale, and five cytoplasms from the genus Triticum. He concluded that CMS derived from Triticum appeared to present fewer problems and pointed to the moderately successful commercialization of hybrids produced with the T. timopheevii CMS system in the United States. Development of restorer lines (R-line) to effect restoration of normal pollen fertility to the F1 hybrid involves the discovery and incorporation of fertility restoration (Rf) genes. Restoration genes from a number of species and from common wheat have been identified and are scattered throughout the ABD genomes (Wilson, 1984). The species that is the cytoplasmic donor is often a source of fertility restoring genes, and a number of Rf genes have been derived from T. timopheevii (Virmani and Edwards, 1983). Fertility restoration is under complex genetic control, and is further complicated by differences among females for ease of restoration and by the effect of the environment on fertility restoration (Wilson, 1984). Wilson (1968) attempted to classify environments as "shallow sterile", "sterile" and "deeply sterile". All of this has caused much difficulty in developing agronomically acceptable R-lines that give complete fertility restoration of the F1 hybrid. The CMS system requires complete and stable male sterility and complete restoration of fertility to the F1 hybrid in a number of environments. While R-lines have been developed that do restore complete fertility, the difficult task of continuing to make genetic progress in developing agronomically improved R-lines remains as the most significant obstacle in the continued development of CMS hybrid wheat. The use of marker-assisted selection for Rf genes, as with restriction fragment length polymorphism (RFLP), would seem to increase the probability of making agronomic progress while retaining Rf genes in the male population (Ma and Sorrells, 1995). The first generation of chemical compounds to be tested as CHAs was developed for other purposes, most notably as anti-lodging or height-reduction agents. They generally caused a high degree of phytotoxicity at rates required for effective sterility. This often resulted in poor female receptivity or fertility, or failed to produce adequate male sterility over a range of environments. Ethephon, gibberellins and RH531 would be examples of these chemicals. The risk of commercial production or their utility in developing breeding populations is unacceptable with any of this class of compounds. The second generation of compounds was developed and tested specifically for CHA activity. These were generally found to work within a narrowly defined set of conditions. Phytotoxicity often was observed outside of these conditions, which generally included a narrow window of chemical application and a restricted array of genotypes. RH-0007 (Hy-brex) - an example of this class of compounds - was used for commercial production in both the United States and Europe. Although McRae (1985) described the compound as "appearing close to the ideal", risk of commercial production with this compound proved to be rather high, and hybrid seed quality was generally compromised. The current generation of CHAs was developed specifically for their male pollen-suppressing activity. They provide a much improved safety margin with significantly reduced phytotoxic effects. They also provide for improved seed quality and are able to be used on wide array of genotypes. The Shell compound WL 84811 and the Monsanto CHA GENESIS are examples of this class of chemistry. Development of WL 84811 has been discontinued, but GENESIS has received full commercial registration in the United States and a provisional registration in France. It is currently being used in commercial production of hybrid seed on both continents. Pickett (1993), Virmani and Edwards (1983) and McRae (1985) each list a number of chemicals that have been evaluated by various researchers for their potential as CHAs. The effects of these compounds on pollen control and phytotoxic activity are briefly described. He et al. (1998) state that CHAs have been extensively studied and list five that have been established as efficient hybridizing agents, including several made in China. is safe and non-toxic to the environment. While there is a rather large number of chemicals that cause male sterility in wheat, there are very few that meet most of the above requirements. Once a chemical is identified as having some CHA activity, much work needs to be done to identify the optimum time and rate of application. Additionally, application rates can vary with environment and genotype. Rates also can be modified with the use of chemical adjuvants and surfactants. development and improvement of heterogeneously diverse breeding populations, such as Reid and Lancaster open-pollinated maize cultivars or the Kafir and Milo sor-ghums, is made possible. costs associated with identification, development and registration of the compound. It should be pointed out, however, that some of these disadvantages are also issues in a CMS system. Genotypes x environment interactions are, for example, also a problem in developing males with adequate fertility restoration in an array of environments. Similarly, male fertility can be a problem with a CMS female that does not have stable cytoplasmic sterility or that has a B-line that cannot be converted to complete pollen sterility (Wilson, 1984). A number of other hybridizing systems have been proposed. Examples include a recessive genetic male sterility system combined with chemical restoration (Wilson, 1984), nuclear male sterility (NMS), such as the XYZ system of Driscoll (1985) (see Pickett, 1993 for a review), or photothermal-sensitive systems requiring different day-length and temperature regimes (He et al., 1998; Murai, 1998). With the continued development of biotechnology, it seems likely that bioengineered hybridizing systems may also be developed. However, the use of CHAs to develop breeding populations and identify specific hybrids for conversion to nuclear inherited systems of hybrid production seems efficient and perhaps necessary. Heterosis is the manifestation of heterozygosity expressed as increased vigour, size, fruitfulness and resistance to disease, insects or climatic extremes relative to either the high-parent or the mid-parent value. Briggle (1963) was among the first to review heterosis in wheat. Varying estimates of heterosis were reported among the 20 references cited. Among his conclusions, Briggle notes that all parental combinations do not result in expression of hybrid vigour, and some do not perform as well as either parent involved in the hybrid. Sufficient hybrid vigour would be available only with specific parental combinations. Johnson and Schmidt (1968) cited 12 additional studies conducted before 1967 in which F1 hybrids outyielded their high parent, and one study in which no hybrid advantage was observed. All of these studies were conducted as space-planted experiments that did not approximate sowing densities in common cultural practice. Virmani and Edwards (1983) reported on 21 studies that supported Briggles observations that heterosis does exist when compatible parental combinations are made. They also suggest that hybrid advantage is a function of three factors: (i) breeding-method efficiency (rate-of-progress); (ii) negative or positive effects of the system used to produce the hybrid; and (iii) the inherent level of heterosis. They also suggest that "When ... genetically diverse pools of ... inbreds are available, ... it is reasonable to assume that consistently higher levels of heterosis will be obtained." Pickett (1993) presents a thorough review of North American and European large- and small-scale trials investigating the magnitude of heterosis for grain yield and other traits. In the small-scale trials, sowing densities were low or were space planted. The large-scale trials more closely approximated normal sowing densities. The small-scale European trials of winter wheat hybrids reported from 1934 through 1976 appear to indicate that heterosis of 30 percent and greater is possible. Eleven authors reported maximum high-parent heterosis ranging from 14.2 percent to 74 percent. However, Pickett (1993) holds their validity in question due to the low sowing density. The results of three authors reporting on heterosis in spring wheat hybrids were also summarized: (i) heterosis was found in two of six hybrids, with the most being 7.5 percent above the high parent; (ii) forty-four of 48 hybrids showed heterosis, with 40.7 percent being the maximum; and (iii) no hybrids were detected that exceeded the best available lines. 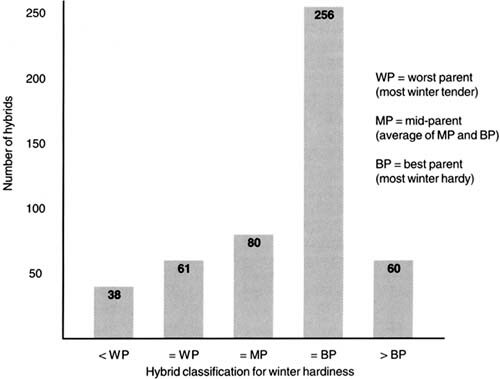 Heterosis for winter wheat hybrids evaluated in small-scale North American trials is summarized by Pickett (1993) as "clearly demonstrating simple heterosis in winter wheat". Maximum high-parent heterosis ranged from 24.7 to 76.0 percent among the hybrids reported on by 13 authors surveyed from 1931 to 1982. In small-scale spring wheat trials conducted from 1921 to 1980 in North America, Pickett (1993) concludes that a number of reports failed to confirm a statistically significant level of heterosis for grain yield. However, maximum high-parent heterosis for the best hybrid in the respective trial reported on by each of 12 different authors still ranged from 3.9 up to 88.0 percent. Pickett (1993) also compiled results on heterosis in spring wheat hybrids from authors in India, Pakistan, Bangladesh, Australia and Mexico. Impressive levels of heterosis were reported, although it must be noted that a number of measurements were based on single plants. Maximum high-parent heterosis from 1938 to 1986 by 13 authors ranged from 9.0 to 160.4 percent. In his summary of larger trials with near normal cropping densities, Pickett (1993) summarized the results of 19 authors who had utilized either CMS (seven authors), CHA (11 authors) or NMS (one author) as the sterility system for hybrid production. Each author reported maximum high-parent heterosis ranging from 2.8 to 40.7 percent. Standard heterosis, the comparison of a hybrid to a local check cultivar, ranged from -3.8 to 32.1 percent. The hybrid wheat breeding programme of HybriTech US in the soft red winter wheat market class in the United States had the practice of including parents in the conduct of the hybrid trial. There were two reasons for this practice: (i) to develop an understanding of heterosis in soft red winter wheat; and (ii) to help develop heterotic breeding populations by assigning heterotic inbreds to opposite gene pools. Only parents with breeding value or interest were included as parents in the hybrid trials. Frequency distribution of best parent heterosis values for grain yield in HybriTech US soft red winter wheat hybrids, 1984-1996. HybriTech US evaluated 3 200 different hybrids and their respective parents in the replicated testing programme during the years from 1984 to 1996. Plot size was approximately 3.7 m², and sowing density was about 2.8 million plants/ha. This is only slightly below a normal sowing density of around 3.2 million plants/ha. A randomized block design with single replicates and multiple locations, or two or three replicates and multiple locations was used. The number of entries per experiment ranged from 20 to 100. Best parent (BP) heterosis was calculated as: 100 * (F1 - BP)/BP. Figure 9.1 shows the frequency distribution for this normally distributed variable. The mean of the distribution is 104.6 percent and the standard deviation is 10.4 percent. Data on 85 hard red winter wheat hybrids from a similar testing programme in the Great Plains region of the United States had average best parent heterosis of 103.4 percent with a standard deviation of 6.9 percent. Although a number of the early reports on heterosis were quite large when evaluations were conducted under space-planted conditions, it is believed that this range of values is more in line with realistic expectations under normal sowing conditions. Much of the literature on inbreeding depression centres around the idea of utilizing the remaining heterosis from segregating generations as a means of improving crop production while reducing the cost of the commercial seed. Seed of the F2 generation from CMS-derived hybrids would segregate for restorer genes and theoretically have from 0 to 100 percent fertility. CHA hybrids would not be expected to segregate for fertility restoration, but selection of parents for phenotypic or genotypic similarity may be necessary to prevent extreme differences in subsequent generations. aData are from hard and soft red winter wheats grown at various locations in the United States in HybriTech US experiments. bInbreeding depression percent: ((F1 - F2)/F1) x 100.
cSignificant at P = 0.05 represented by *; ns = non-significant. Although this proposal has been around for a number of years, it has yet to be adopted by any commercial seed company. Most of the reports in the literature show the F2 generation to have significant inbreeding depression and does not appear to offer an advantage over line cultivars (Pickett, 1993; Kratochvil and Sammons, 1990). HybriTech US conducted studies on inbreeding depression of CHA hybrids in both hard and soft red winter wheat market classes from 1981 to 1995. A compilation of these results is presented in Table 9.1. The average inbreeding depression for 40 different hybrids evaluated in these experiments was 7.0 percent and ranged from -6.8 percent to 15.3 percent depending on the year and hybrid combination. Grain yield is clearly the economic trait of interest in hybrid wheat. However, as Pickett (1993) points out, many other characteristics related to performance may exhibit heterosis. In a compilation of studies investigating yield components, 26 authors list grain number as a principal source of heterosis. Grain weight is listed 24 times as a source of heterosis, and tillering is listed 19 times. A number of these 37 authors list more than one component as a source of heterosis in the hybrids they investigated. A number of studies and observations confirm that heterosis often is expressed for plant height, but the expression is highly cross specific. Virmani and Edwards (1983) show average plant height of hybrids to approach the taller parent in four of five years and to exceed the tall parent in one year. They also show these spring wheat hybrids to consistently show dominance or over-dominance for earliness. Winter wheat hybrids also approach and occasionally exceed the early parent for days to heading (G. Cisar, personal observation, 1984-1991). more winter tender than the worst parent. A graphical presentation of this distribution is presented in Figure 9.2. Note that the winter hardiness of the hybrid most often equals or exceeds the more winter-hardy parent. Volume weight of grain is another trait that approaches or exceeds the best parent value. HybriTech US evaluated 637 hybrids and their parents for volume weight over seven different years and multiple locations in its soft wheat programme. Average volume weight was 69.0 kg/hl for the low parent, 72.2 kg/hl for the high parent and 72.9 kg/hl for the hybrid. In the hard red winter wheat programme, 77 hybrids and parents were evaluated for volume weight. Average volume weight was 77.3, 78.7 and 79.2 kg/hl for the low parent, high parent and F1, respectively. In comparing the performance of hybrids versus cultivars, it is useful to introduce the concept of hybrid yield advantage. Hybrid yield advantage is simply defined as the difference between one or a group of adapted check cultivars and one or a group of hybrids. Comparisons based on hybrid advantage are of greater value than percentage comparisons when making economic evaluations, since the economic value of a percentage yield can be greatly influenced by the check cultivar mean. Figure 9.3 is a graphical representation of a typical yield distribution of hybrid wheat relative to adapted check cultivars. The data set used to generate this graph included 335 hard red spring wheat hybrids evaluated at one location in North Dakota, United States, in 1996 and 254 hybrids evaluated at two locations in the Pacific Northwest, United States, in 1997. However, the graph is generally representative of the typical response observed in many different market classes of wheat. The mean hybrid advantage, or the difference between the mean of the varietal check yields (arbitrarily set at 0.0 tonnes/ha) and the mean hybrid yield, ranged from 0.26 to 0.45 tonnes/ha. It is interesting to note that the distribution of hybrid yields approximates a normal distribution. According to Baker (1986), the cumulative distribution of genotypic values approaches a normal distribution as the number of individuals and the number of independent loci become large. "With as few as five independent loci, the distribution of genotypic values is close to that of a normal population with the same mean and variance." This observation implies that selection of hybrids within the upper portion of the distribution will result in a selected group that is normally redistributed around the selected mean in subsequent cycles of testing and selection. This same response is expected for cultivars. Thus, the probability of identifying one or more hybrids that exceed a given economic threshold appears to be largely a function of testing adequate numbers of hybrid combinations. It does not appear to be any less probable than selecting an improved cultivar from a similar starting population size. The successful adoption of any hybrid crop requires that a certain level of economic profitability be met. Wheat - historically cultivated as a self-pollinated crop - requires a level of economic justification similar to other hybrid crops, much like corn and sorghum, if it is to be widely adopted. For the present time, hybrid seed costs more than certified varietal seed or farmer-saved seed. risk of crop failure due to natural disasters. The relationship between hybrid advantage and the expected or realized return on investment in hybrid seed varies with the commodity price of wheat. Lower hybrid advantage requires a higher market price to generate an adequate return on the seed investment. Conversely, a greater hybrid advantage still gives an attractive return at a lower market price. A number of models suggest that an economic threshold for converting from cultivars to hybrids requires a hybrid yield advantage in the range of 0.65 to 1.0 tonnes/ha, generating a return-on-investment of 1.5 to 2.0. Several of the factors affecting the economics of hybrid wheat are discussed in detail below. Some experimental evidence exists to suggest that hybrids can tolerate slightly reduced seeding rates compared to the established local practices for cultivars. Presumably, this is due to better seedling vigour and the ability to support slightly higher tillering capacity than cultivars. In practice, the extent to which most hybrids can respond to lower seeding rates is probably not much beyond 10 percent lower than the traditional cultivar rates for a given area, though this is an area that deserves more attention. The extent to which farms are planted to certified seed varies from region to region, though many farmers recognize the value of planting high-quality seed. Farmers who do plant back-saved seed have come to recognize that grain is not seed, and typically take extra precautions to reduce levels of contamination and improve germination and vigour by some form of seed conditioning prior to sowing. An accurate assessment of economic return should consider the true cost of saved seed to include storage, interest, seed conditioning and the local commodity price of the grain. aComparisons are between all hybrids and all varieties, and between the top three in each group. In areas that traditionally have higher seeding rates (120 kg/ha and greater), a correspondingly greater increase in hybrid yield is required to demonstrate an economic advantage for hybrids. Areas with moderate (55 to 85 kg/ha) seeding rates can have a lower hybrid advantage and still prove economical. Environments with low yield potential, such as extreme dryland ecosystems, may not be able to deliver an economic hybrid advantage despite relatively low seeding rates. Limited supplies of hybrid wheat seed currently are being sold in the United States in the range of US$0.65 to 1.10/kg, compared to a certified seed price range of approximately US$0.25 to 0.55/kg. An estimate of the true cost of farmer-saved seed in the United States is US$0.17 to 0.35/kg. The recent global trend toward reduced government intervention, including price support systems, has already resulted in greater volatility in grain prices, stocks-to-use ratios and grain import/export destinations. Commodity value also may be influenced by grain grade, protein content and volume weight. Obviously, higher commodity prices make the cost of hybrid seed easier to justify. When these factors are present in the marketplace, they need to be considered in an economic analysis of the benefits of hybrid wheat. In one HybriTech US study (Table 9.2), eight spring wheat cultivars were compared to 16 spring wheat hybrids for their economic advantage over a two-year period. Grain protein, volume weight and average net selling price were similar for the hybrids and cultivars. However, when the three best hybrids were compared to the three best cultivars, the hybrids averaged 0.69 tonnes/ha higher yield, 0.6 percent lower protein and US$8.14/tonne lower unit value. Assuming an additional US$50/ha investment in hybrid seed with a ten-year average selling price of US$154/tonne, the three best hybrids returned US$25/ha more than the three best cultivars. This indicates that the economics are becoming sufficiently attractive for growers to risk planting hybrid wheat on a portion of their farm to determine economic viability using their own management practices. Long-term increasing population trends, rapid loss of arable land and gradual increases in standards of living and consumption would suggest that demand for cereals, including wheat, should remain strong and become stronger in the near future. Hybrid wheat represents a sustainable technology for keeping pace with this increasing demand from diminishing resources. A number of authors have noted the difficulty of adequately evaluating hybrid performance when seed quantities are small. When only limited numbers of crosses can be evaluated, it is difficult to sample a large number of parents and select those that combine well and have the most heterosis. Wilson (1984) pointed out that development of diverse populations that combine well are desired for the initiation of a hybrid wheat breeding programme. He mentioned as examples the Reid and Lancaster maize populations and the Kafir and Milo sorghums. coefficient of parentage and pedigree data. Tester males have been selected in each of these pools in several maturity groups to help drive the improvement of the population cross and increase average interpool heterosis. Table 9.3 shows the change in average best parent heterosis between inbreds from inter-population hybrids. Improvement in average heterosis ranged from 1.7 to 3.2 percent over the 12-year period. The development and improvement of heterotic breeding populations is important in hybrid wheat breeding. However, since wheat has evolved as a self-pollinated species, it is equally important that these populations and inbreds be developed for out-crossing efficiency. This point needs to be clearly stressed, as seed yields in the hybrid production field are important to the economic viability of the hybrid seed enterprise. It has long been recognized that a major constraint in the development of hybrid wheat has been the low seed-multiplication ratio in production fields and the relatively high seeding rates required in commercial fields. Floral biology of the wheat plant, including heritability estimates for the various floral structures affecting cross-pollination, is well summarized by Pickett (1993) and Virmani and Edwards (1983). The heritabilities they summarized for these traits range from low to high, but are most often moderate to high. This suggests that much midterm progress should be made in improving the cross-pollinating ability of inbreds derived from breeding populations. Plate 6 shows the degree of flower opening and stigmatic branching of a CHA-sterilized female. Plate 7 shows the anther extrusion of an exceptional pollinator male. aData are from the Crossing Block Nursery in Lafayette, Indiana, United States (not adjusted to ED95). Observations on anther extrusion, anther length and duration of pollination in males are readily obtainable. Flower opening is easily observed in male-sterile females, but other traits, such as stigma size or pollen viability, are more difficult, though not impossible, to evaluate, based on the authors experience. Hybrid seed yield data from experimental hybrid production nurseries can be used to evaluate females, males and specific hybrid combinations. It is important that factors, such as chemical overdose, chemical underdose or poor nick (optimal flowering coincidence), do not bias the evaluation of the inbreds being utilized. An evaluation of two different CHAs (Table 9.4) used in experimental hybrid production shows the effect of a less ideal CHA. RH-0007 activity was much less stable over environments and had a more dramatic phytotoxic effect at overdose rates. GENESIS is much more stable and far less phytotoxic at overdose rates, and thus the heritability of hybrid seed yield is much improved with the GENESIS hybridizing agent. A number of issues are important in the economic production of hybrid seed. These include the identification of an optimal production environment, selection and training of growers to manage and produce the hybrid seed, and identification and management of factors influencing the relative flowering dates of the female and male parents. Pickett (1993) has done a thorough job of reviewing the floral biology of the wheat plant and of summarizing results from the literature on small- and large-scale production research. cooler environments (higher altitudes) often seem to have better seed set, presumably due to increased pollen viability and reduced stress on the crop. Production fields are currently planted in alternating strips of female and male parents with either CMS or CHA hybridization methods. Practice also dictates that when possible these strips are planted at right angles to the prevailing wind pattern during the anticipated pollination period. The actual width and resulting ratio of female to male are often determined in large part by the width of commercially available planting, spraying and harvest equipment. Care must be taken to prevent accidental mixing of the male and female from planting through harvest. In general, narrower and more frequent male strips permit higher ratios of female to male, which results in more hybrid seed per total production hectare. Typical female to male ratios in production fields in the Great Plains of the United States are in the 2:1 to 4:1 range. Male widths from 1.5 m to greater than 6.0 m have been tried in combination with females strips from 3.0 m up to 20 m wide. Experience has shown that hybrid seed set typically begins to drop off sharply more than 12 m from a source of pollen. However, environments with less wind than the Great Plains region of the United States may require lower female to male ratios and a narrower width of the female parent. In 1998, seed yields on approximately 3 000 ha of GENESIS hybrid seed production averaged more than 3 000 kg/ha, and seed yields in France on a similar area averaged more than 5 000 kg/ha. Plate 8 shows a typical production field in the Unites States a few weeks after pollination. Maximum hybrid seed set for a given hybrid combination will occur when the lemma and palea of the female is open with a receptive stigma at the same time that the male is shedding pollen. This requires that the male be two to five days later in days-to-heading than the female to achieve optimal flowering coincidence (nick). Flowering data, including the day of 50 percent pollen shed (male) and 50 percent flower opening (female), and seed yield data were collected in top-cross nurseries over nine years in the HybriTech US soft wheat programme. These data are summarized in Table 9.5. Nick was calculated as the day of 50 percent pollen shed minus the day of 50 percent flower opening. Hybrid seed yields were optimized when flowering nick was plus two or three days, although commercially viable seed yields with wider or narrower nicks have been obtained. Females often are planted at higher populations than males to reduce tillering and minimize differences in growth stage for optimal efficacy of the CHA. Conversely, some males will respond to a somewhat reduced seeding rate by adding secondary tillers, thus both delaying and spreading the pollen load over a greater period of time to ensure greater likelihood of a favourable nick. In fall-seeded cereals, it is difficult to get a very large adjustment in the nick of the female and male by staggered planting dates. A delay in planting of one week in the fall often translates into only one- or two-day later flowering the following spring, with the associated risk of the delayed fall sowing date. Staggered plantings to adjust nick are somewhat more practical for spring-sown cereals, but can also be limited by day-length sensitivity genes that are more common in spring wheat. Many other techniques, such as burning or mowing of the male, and differential fertilizer application have been attempted to adjust the nick between females and males. All of these have met with varying degrees of success, but they also add to the cost of hybrid seed. aEstimates are from varying numbers of hybrid combinations in top-cross nurseries in the HybriTech soft wheat programme, from nine crop years. One of the potential benefits of molecular genetic hybridization systems would be the complete elimination of separate male and female strips. This would greatly simplify planting and harvesting operations, and should result in increased hybrid seed production and a lower cost of goods due to the close juxtaposition of male pollinators to receptive females. Such a system would also eliminate much of the risk associated with unfavourable weather at the time of CHA application, as discussed below. Most CHA hybridization systems have an optimal growth stage for application of the chemical to the female parent. For GENESIS, the optimum stage of application for most gen-otypes is between Feekes growth stage 8.0 and 9.0. Feekes growth stage 8.5 is equivalent to the flag leaf being 50 percent emerged. Proper evaluation of the growth stage for a female parent in a production field requires sampling an adequate population of individual female plants over the entire production field. An important reason for selection of uniform fields is to minimize the variation in growth stage within and between the different areas in the production field. Following application of the CHA, a minimum rain-free period is needed for uptake into the plant to achieve sterility. GENESIS application requires a 12- to 24-hour rain-free period, with a re-application being necessary if more than 2.5 mm of precipitation falls within this period. An advantage of CMS hybridization systems is that estimating growth stage and paying attention to rainfall patterns is not necessary in the management of the production field. Quality of hybrid seed from the production field may be compromised if sterility of the female parent is not complete. Several methods of assessing the efficacy of the CHA treatment of the female parent have been tried with varying degrees of success. These include the use of bags or pollen tents to prevent external pollination, close monitoring of the production field and the use of electrophoretic or chemical tests. The use of pollen bags or tents gives an objective assessment of sterility of a comparatively large population at a relatively low cost. Any seed set under bagged heads is presumably due to self-pollination, indicating that full sterility was not achieved. It should be noted that bagging itself might cause reduced seed set, which must be accounted for in the assessment of sterility. In practice, it is often sufficient to simply monitor the treated female plants and observe the percentage of sterile and open florets a few days after receptivity of the stigma. Depending on the mode of action of the specific CHA, it may also be possible to observe the dehiscence of fertile pollen from the anthers, as is the case with GENESIS. Generally, complete flower opening will not occur if plants have a significant amount of self-fertile pollen. Development of a quantitative field test to measure the concentration of CHA-active ingredients early in the growth of the wheat spike would have the potential of helping to determine the level of sterility in treated female parents. Such a diagnostic test would be of help in evaluating problem production fields, which may be associated with a particular female genotype, or a questionable rain-free period following CHA application. However, the ultimate method for assessing purity of the hybrid seed lot requires an analysis of the hybrid seed or the F1 plants. Analysis of F1 plants is particularly problematic for winter wheat, which is sold shortly after harvest. Spring wheat could be evaluated for morphologic traits before being placed into commerce. The use of electrophoresis or molecular marker techniques can give an objective assessment of purity of the F1 seed, although the sample size may be small due to the cost of these techniques. Female and male strips must be kept separate during and after harvest. While it may be possible to remove the male strips after pollination, the loss of this grain would add to the cost of production of the hybrid seed. The typical practice is to completely harvest the grain in the male strips prior to starting the harvest of the hybrid seed in the female strips. This minimizes the chance of contamination of male seed with hybrid seed. Cleaning and conditioning of hybrid seed is essentially the same as would be done for a certified crop of varietal wheat seed. First-generation and some second-generation CHAs had a tendency to produce shrivelled seed. Newer compounds generally produce seed that is sound and visually similar to self-pollinated seed produced in the same environment. On occasion, hybrid seed can be larger than untreated seed. Larger seed can be a result of having a reduced sink capacity in plants with reduced seed set. Large seed size, while generally favourable to seedling vigour and growth, can add to the cost of goods and reduce the economic advantage of hybrids if planting high populations is the prevalent farm practice. The development of improved CHA chemistry and technology of the past decade has allowed breeders of hybrid wheat to avoid many of the problems involved with the CMS system. Large numbers of hybrids can be produced with breeding lines or populations of interest, and heterotic population structures can be developed and improved. Hybrid seed yields, economically important for the survival of the hybrid seed industry, can also be evaluated with the use of CHAs. The heritability of traits important in improving the cross-pollination required in hybrid seed production are moderate to high, and thus reasonable genetic progress can be expected in developing parents with improved seed yield efficiency. The opportunity and possibility of developing economically acceptable hybrids that reward the seed company and farmer, and provide for an increase in world food production, has considerably improved. Hybrids produced with CHA technology will continue to enter official trials and from there proceed to the marketplace where their economic advantage will be realized. Baker, R.J. 1986. Selection indices in plant breeding. Boca Raton, FL, USA, CRC. Briggle, L.W. 1963. Heterosis in wheat - a review. Crop Sci., 3: 407-411. Bruns, R. & Peterson, C.J. 1998. Yield and stability factors associated with hybrid wheat. In H.-J. Braun, F. Altay, W.E. Kronstad, S.P.S. Beniwal & A. McNab, eds. Wheat: Prospects for Global Improvement, Ankara, 10-14 Jun. 1996, p. 23-27. Dordrecht, Netherlands, Kluwer Academic Publishers. Driscoll, C.J. 1985. Modified XYZ system of producing hybrid wheat. Crop Sci., 25: 1115-1116. He, Z.H., Du, Z.H. & Zhuang, Q.S. 1998. Progress of wheat breeding research in China. In H.-J. Braun, F. Altay, W.E. Kronstad, S.P.S. Beniwal & A. McNab, eds. Wheat: Prospects for Global Improvement, Ankara, 10-14 Jun. 1996, p. 47-53. Dordrecht, Netherlands, Kluwer Academic Publishers. Hoagland, A.R., Elliott, F.C. & Rasmussen, L.W. 1953. Some histological and morphological effects of maleic hydrazide on spring wheat. Agron. J., 45: 468-472. Johnson, V.A. & Schmidt, J.W. 1968. Hybrid wheat. Adv. Agron., 36: 145-214. Kratochvil, R.J. & Sammons, D.J. 1990. A comparison of soft red winter wheat F-2 populations, their F-1 hybrids, and parents. J. Prod. Agric., 3: 363-367. Liable, C.A. 1974. Chemical methods for pollen control. Proc. 29th Ann. Corn and Sorghum Res. Conf. Pub., 29: 174-182. Ma, A.Q. & Sorrells, M.E. 1995. Genetic analysis of fertility restoration in wheat using restriction fragment length polymorphisms. Crop Sci., 35: 1137-1143. McRae, D.H. 1985. Advances in chemical hybridisation. Plant Breed. Rev., 3: 169-191. Mock, J.J. 1995. A new look at hybrid wheat and its role in improving yield and quality. In C.J. Peterson, ed. Proc. North American Wheat Workers Workshop, Kansas City, MO, USA, 1994, p. 20-34. Lincoln, NE, USA, National Wheat Improvement Committee. Murai, K. 1998. F-1 seed production efficiency by using photoperiod-sensitive cytoplasmic male sterility and performance of F-1 hybrid lines in wheat. Breed. Sci., 48: 35-40. Panayotov, I. 1983. The cytoplasm in Triticinae. In S. Sakamoto, ed. Proc. 6th Int. Wheat Genetics Symp., Kyoto, Japan, 28 Nov.-3 Dec. 1983, p. 481-497. Kyoto, Japan, Kyoto University, Plant Germ-Plasm Institute. Pickett, A.A. 1993. Hybrid wheat: results and problems. Adv. Plant Breed., Suppl. J. Plant Breed., 15: 1-259. Virmani, S.S. & Edwards, I.B. 1983. Current status and future prospects for breeding hybrid rice and wheat. Adv. Agron., 36: 145-214. Wilson, J.A. 1968. Problems in hybrid wheat breeding. Euphytica Suppl., 1: 13-33. Wilson, J.A. 1984. Hybrid wheat breeding and commercial seed development. Plant Breed. Rev., 2: 303-319. Wilson, J.A. & Ross, W.M. 1962. Male sterility interaction of the Triticum aestivum nucleus and Triticum timopheevii cytoplasm. Wheat Info. Serv. (Kyoto), 14: 29-30.